Get over Vail Pass and it shouldn't be too bad. Ended up driving this afternoon to Lakewood in Denver, was nice and sunny on vail pass around 4pm today . One interesting thing was the avalanche warning for tonight/tomorrow, the snow pack wasn't really thick so can easily see some happening. Smart move. Worse places than Denver to have to spend a night in. Avalanche watches aren't to be trifled with either, especially for that portion from Vail to the tunnel. Saw something about it. Both sides were shut down last I saw. Given the weather coming in on that area, can't imagine they'll be getting the westbound side cleared anytime soon. Not a great night to have to take the alt route either. Not a great night to have to take the alt route either. I’ve rented a vehicle only 3-4 times and have always taken the shuttle. Never had any problem with the trip either way. Never needed chains. I don’t even think chains were needed for that trip the last few days during this storm, but I’m not for certain. All I heard, read, and saw the last few days were about the roads going in/out of Kirkwood and to/from Sacramento. I’ve been getting conflicting responses from locals, skiers, and Heavenly employees regarding this. Basically there are very few shuttles compared to previous years. I’m used to seeing them all day long and haven’t seen one since I’ve been here (five days). If you’re staying anywhere near the village, then you don’t need to use any shuttle. I'm glad my weather fascination can be helpful to people. Though I'm only really useful for that run of resorts on I70, just by being familiar with the area. The mountains are a tough place to forecast for seasoned pros. That was me until I moved out to Summit County last year. Now I’m somewhere around 80 days on the season and definitely broke. It’s 100% worth it though. Ok good to know. I considered the shuttle but I know one day we are just going to drive around the entire lake and stop off at little bars/stores/restaurants all day so we'd need a car for that anyway. Me and a few buddies are looking at heading to Taos Ski Valley at the beginning of March. Has anyone ever been? Any advice for someone visiting the area for the first time? We are driving and staying at the RV park. It should be a sub $500 ski trip! I have heard that it used to be pretty advanced terrain, but they have put a lot of effort in to making it more open to intermediate skiers. There is some very advanced terrain at Taos. They have freeskiing competitions there on Kachina. 2 people just died in an inbounds avy a couple of weeks ago. Stay off the steeps and yall will be fine. Skied Deer Valley Saturday & Solitude Sunday. SLC resorts just got drilled. Have you ever been to Edgewood? And if so what were your thoughts? Just booked a day of private lessons at Copper first weekend of March. I'm ready to start hitting the park and practicing ramps, boxes, rails, etc. Any tips for a park beginner would be appreciated. Only advice I have is just learning from experience. Bend your knees, don’t look at your skis, wear a helmet, get down the mountain at your pace, buy a buff, don’t be the guy that stops the lift & have fun. This week in Jackson Hole was insane. About of a foot of heavy, wetter snow on Sunday. Spitting rain down in town. Then a DUMP overnight on Sunday into Monday morning for another 12". And then another DUMP overnight Monday night into Tuesday morning. By Tuesday morning, town was running out of places to put snow. The snowbanks have tripled in size since last week. My old boss from Steamboat was in town. He bought a private mountain guide on Tuesday morning and saved me a spot. We got to go up early tram, and cut lines all day. 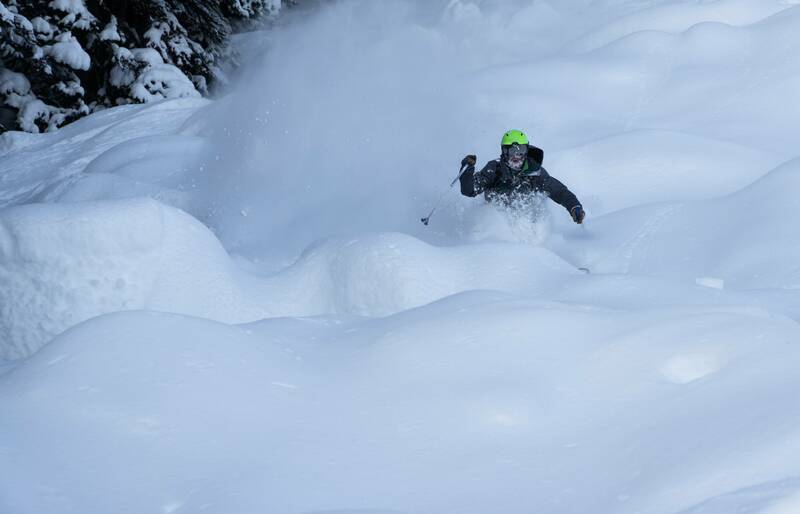 I heard long time JH locals talking about how that day was the deepest day they've ever had inbounds at Jackson Hole. The Hobacks untouched in 24" of snow was a religious experience. I couldn't have timed it better to have my old boss in town. Early tram was fricking all-time. Surrounded by pro-skiers, including the Warren Miller film team, at the top of the tram, waiting for the mountain to open, on an all-time pow day. It was truly epic. Baws, how easy is it to mount and adjust your bindings? Current skis have about 100 days on them. Time for something new. Being in LA no place for tuning. I pay a pro to do it the next trip to the slopes.